Renault has gone straight to the heart of the target market for its new Captur crossover with 'Captur Life', the biggest ever car event in Westfield Shopping Mall. 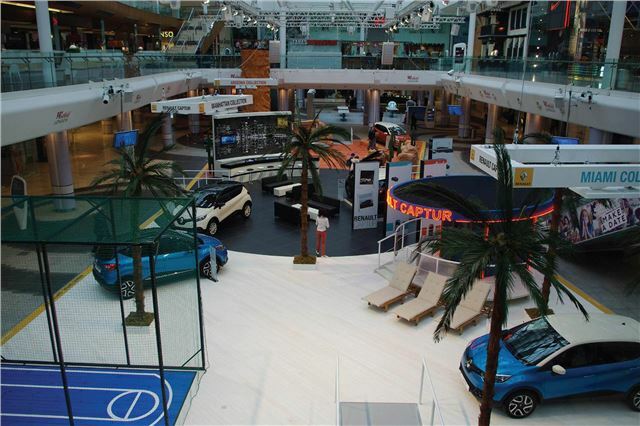 From 20th May and 19th June, Renault has taken over Westfield London W12’s main atrium, in the largest ever product launch in London’s premier shopping venue, to launch its exciting new Captur crossover. Over the course of the four-week promotion, the Captur will have a colourful, fun, and 100% interactive presence, including a series of daring and entertaining activities for all the family, as well as a soon-to-be-revealed TV celebrity. Captur, Renault’s new compact crossover, is available to order now in UK showrooms, but to get it out to a significant audience ahead of its 1st July official launch, it has chosen arguably London’s most high-profile shopping destination, which receives over half a million visitors per week. The Captur is fully customisable, inside and out. It’s also packed with smart technology, such as the R-Link infotainment system, and a range of fuel sipping engines. On top of that, it’s got a clever dual-height bootfloor and zipped, removable and washable seat covers - perfect for a family car. Another reason for choosing a shopping centre location is Captur being offered in three, themed, colour-coordinated and eye-catching ‘Collections’; Arizona, Miami and Manhattan. To highlight these iconic locations, Renault will be re-creating the different landscapes associated with these well- known American destinations, with a range of interactive and artistic entertainment for the centre’s diverse range of visitors. Covering over 40m x 26m in total, the Experiential Zone for Arizona will be designed to replicate the Grand Canyon, with arid rocky landscapes, a 24ft climbing wall featuring 3D anamorphic floor prints – which to the naked eye look like a sheer 1,500 feet drop, “live” dust art, all surrounded by cactus plants to capture the outdoor adventure spirit. Sitting next to it, Manhattan will be home to a Piano Cocktail Bar straight out of The Big Apple. It will feature 3D perspective art, a “flair barman” creating cocktails live, an automated grand piano and a collection of New York-inspired haute couture fashion. Miami takes a more relaxed, Ocean Drive approach with a little Latin American flair thrown in to excite the senses. Palm trees, sun loungers, a traditional South Beach inspired lifeguard beach hut, NBA replica Miami basketball court, sand sculptures and even a Miami Beach DJ.